The winner of our latest competition will look forward to cleaning – thanks to the lovely folk at Miele. 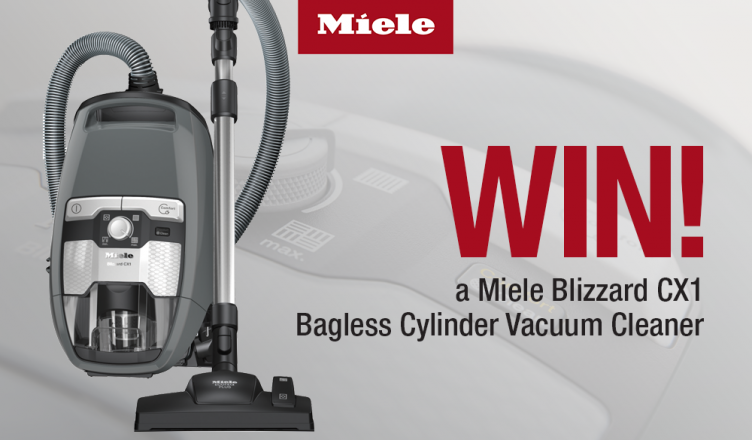 We’ve teamed up with Miele to bring one lucky winner a Miele first: the Miele Blizzard CX1 Excellence Powerline vacuum cleaner. This is Miele’s first ever bagless cleaner so we set one of our reviewers the task of putting it through its paces. Read on to see how it fared and to find out how you can be in with a chance of winning one for yourself! In the box I discovered an array of accessories, vast enough to cope with carpets, hard flooring, wooden floorboards, sofas and even curtains. In our full-to-busting house, one appliance that can cope with so many chores is welcome, as it promises to save on both space and the faff of carting loads of kit about. Once I’d assembled the CX1 (a remarkably easy task), I set to clearing up after our Saturday morning porridge and pancake extravaganza. On initial glance, this so-called extravaganza would appear to involve us tipping large quantities of rolled oats and flour onto the kitchen floor and under the table – the perfect starter task for the Miele CX1! I started off with Miele’s Parquet Twister XL head. This is the perfect floor head for smooth hard floors like lino, wood laminates, tiles and parquet. Measuring at a shade over 40cm width, this made cleaning the kitchen floor a swift and easy task. 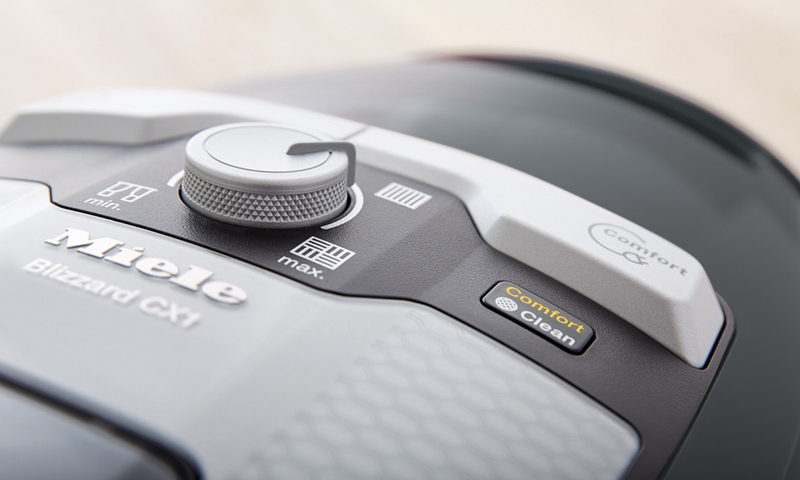 Miele’s Dynamic Drive casters make manoeuvrability an absolute breeze and the comfort grip is ergonomically designed. Miele may have been a while coming up with a bagless vacuum cleaner but it’s clear from the off that they’ve not been resting on their laurels. Their vortex technology powers through the oats, dust and debris; with air flow of more than 100 km/h the floor looks immaculate! Once the kitchen was dealt with, it was time to blitz the rest of the house. I chose the Eco Teq Plus multi-purpose floor-head. With a pivot-and-tilt neck and a reach of 10m I was able to do all the carpets and rid the house of high-up cobwebs (sorry, arachnids) with little effort on my part. Thanks to the 10m operating area and telescopic tube, you don’t need to plug/unplug too often but when you do – or when it’s time to put the machine away – a single press of your foot on the relevant button will retract the cable, housing it safely. There’s even a remote control within the handle, so you can turn the CX1 on and off and even vary the suction without bending or stooping. Simple, yet brilliant design always please me; it shows that the manufacturer cares about the end user (me) as well as the actual product. Carpets done in no time, I was then able to easily switch to the integrated tools to deal with the sofas (accessorised with biscuit crumbs) and even deal with delicate curtains, thanks to a rotary power selector that gives great variation. The upholstery nozzle and crevice nozzle are secured at the back, and I was delighted to find the dusting brush cleverly integrated into the EcoComfort handle; less to find, allowing me to easily transfer from task-to-task. The HEPA AirClean lifetime filter deals with up to 99.999% of even the smallest dust particles, which makes it ideal for households – like ours – with allergies or respiratory issues that are exacerbated by dust, pollen and other allergens . The filter is low maintenance and can even be washed by hand (although the ComfortClean function will carry out an auto clean.) 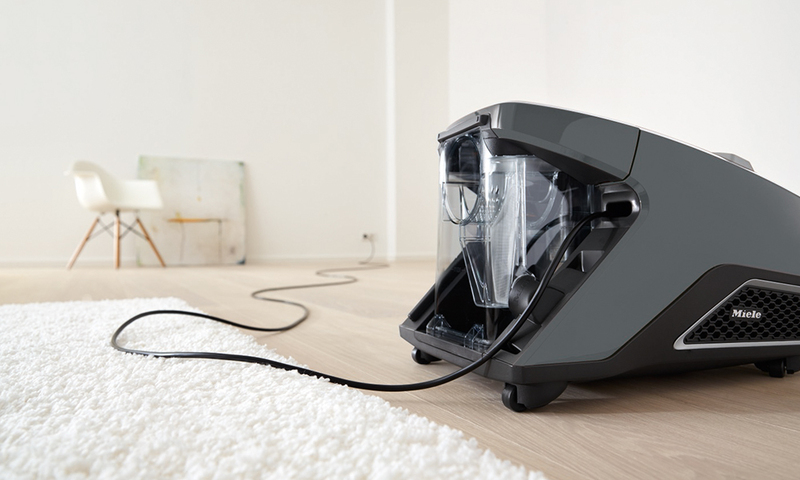 Better news is that Miele’s innovative dust separation, where course debris and fine dust can be emptied separately, is a really hygienic way of emptying the cleaner. In no time at all, I was done with the formerly onerous tasks of cleaning different floors – and had time left to clean sofas and soft furnishings too. From the sleek styling to the incredible cleaning power, the Miele Blizzard CX1 is top of the list for getting everything done in hardly any time. The wait for Miele to showcase a bagless vacuum cleaner has been undoubtedly worth it! To find out more and to be in with a chance of winning a Miele Blizzard CX1 Excellence PowerLine vacuum cleaner with Eco Comfort handle just head to our Facebook, Twitter or Instagram pages to find out how you can enter our brilliant FREE competition. You can also buy the Miele Blizzard CX1 online, view our Miele range online or ask your local store about a demonstration to discover exactly why Miele is such a coveted brand and winner of the Which? 2017 Best Home Appliance Brand of the Year.